As the holiday break neared, Anna and I commiserated (with good humor) about how busy we were. "Eh, it's going to be a Trader Joe's week, right?" I knew exactly what she was talking about. I had already planned for a Trader Joe's week to make the busy season a little easier. My menu plan was based on whatever good stuff TJ's had to make meal time as easy as possible. Here's one of the dishes I made, perfect for the post-holiday detox. This grain salad makes up for the stale holiday cookies we're all still nibbling. Delicious warm or cold, it's on the sweet side — a nice bridge as I retrain my taste buds to be happy with less sugary fare. It's filling and full of good-for-you ingredients. The photograph doesn't do it justice. I'm not sure it's possible to take a good photo of farro. 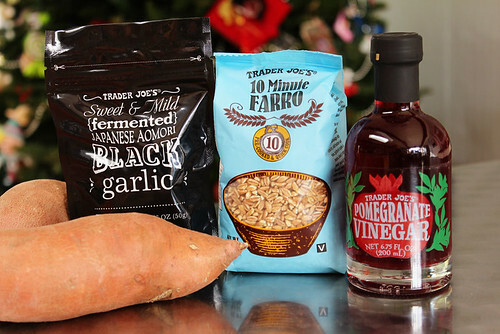 Everything in it can be found at Trader Joe's: fast-cooking farro, sweet potato, pomegranate vinegar, and — my favorite! — black garlic. If you're unfamiliar with it, black garlic is simply fermented garlic. It's savory-sweet, garlicky without the bite. 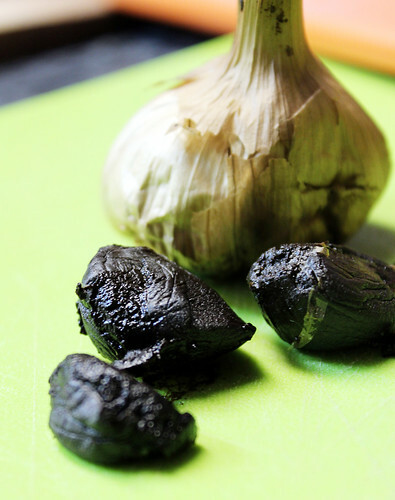 TJ's just recently started carrying black garlic, but it isn't always easy to find. I didn't see it the last time I was there and was worried they had already dropped it. The manager admitted "it's been sort of a dog for us," but they do still stock it. You can find it in specialty stores and online (including Amazon). If you can't find it, no problem. Just sub some regular garlic. And if you don't have a Trader Joe's near you, of course you can find these ingredients elsewhere. If you can't find black garlic, you can leave it out or substitute a clove or two of minced garlic, sautéed in a bit of oil. A bit of cooked sausage also would be a tasty replacement. 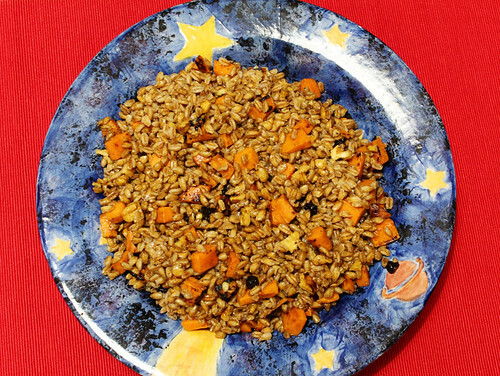 Farro is one of my favorite grains, but if it's out of your comfort zone swap brown rice. Cook farro according to package directions (if you're using raw farro, cook it however you do that — I've only used TJ's!). Whisk dressing ingredients together in a bowl. If you happen to live in a place where it doesn't snow, like we do, you might use this idea to make the kids have a little winter cheer with something else. It was the last hands on class I gave to second and third graders at school this year, after a series of edible craft sessions, which included sweet potatoes and green beans turkeys and a pea spread cemetery for Halloween. The project to celebrate the end of the year was to make a snowman out of mashed potatoes and other foods, and the result was so much fun. We made those my son's classroom today with second and third graders. They were really thrilled to work on the project and eat it right away after finishing. I baked the potatoes at home, and when I brought them to school, they were ready to be peeled with the tiny fingers and mashed easily with forks. Carrots became little noses, bell peppers for the mouths, but of course, some children's couldn't refrain to think outside the model and made...something completely different! 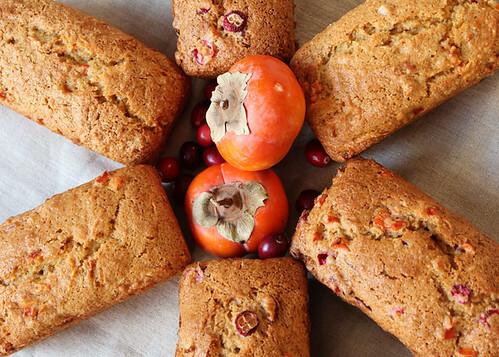 Persimmons and cranberries look like colorful jewels in these golden-colored little loaves. These make lovely gifts for neighbors, hosts, teachers and more during the holiday season. You can freeze them and thaw for gift-giving, or as a treat for your own holiday table. Persimmons are one of my favorite California fruits and they’re plentiful and inexpensive. If you don’t have them near you, you can substitute apples or pears. I made one batch pairing persimmons with cranberries, with just a bit of candied orange peel, and a second batch with sweet potatoes instead of berries. I’m baking vegan, nut-free loaves to minimize any awkward gift-giving issues. Don’t let the V-word scare you! These treats are perfectly tasty, though I admit they’re a little more crumbly than they would be with egg. You can substitute butter and egg for the vegan alternatives in the recipe if you prefer. This is riffing off Mark Bittman’s master recipe for quick bread made with almost any fruit or vegetable. It’s a terrifically versatile recipe, much like buttermilk quick bread. You can tinker with fruit, veggies, and mix-ins as you like, and bake a full-size loaf, mini loaves, or muffins to brighten a wintry morning. If cranberries aren't your thing, try the sweet potato variation. 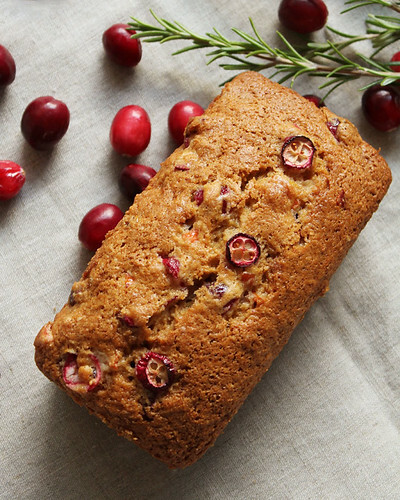 Based on Mark Bittman’s Fruit-and-Nut or Vegetable-and-Nut Bread. To make the flaxseed egg replacer, blend 1 tablespoon flaxseed meal with 3 tablespoons water, and let sit 5 to 10 minutes until gelled. Preheat oven to 350°F. Grease three mini loaf pans or a 9x5-inch loaf pan. In another bowl, blend the juice, zest, and flaxseed egg replacer. Pour the wet mixture into the dry ingredients and stir just until moistened — don’t overmix. Fold in the fruit and any extras. Pour batter into prepared pans. Bake about 40 minutes for mini loaves or an hour for a full-size loaf, until the bread is golden brown and a toothpick inserted in the middle of the loaf comes out clean. Let cool before removing from the pan. 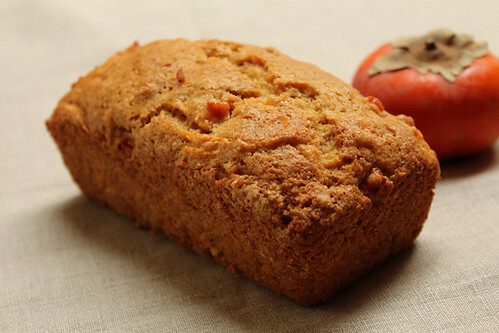 Persimmon and Sweet Potato Tea Bread: Substitute ½ cup grated, raw, peeled sweet potato for the cranberries, and ½ teaspoon nutmeg or cinnamon for the cardamom. Muffins: Bake at 400°F for 20 to 30 minutes.